The minimum charge will not be changed under the revision of train fares effective form 01-10-2018 as announced in the 2018 Budget, the Railways Department said in a statement. 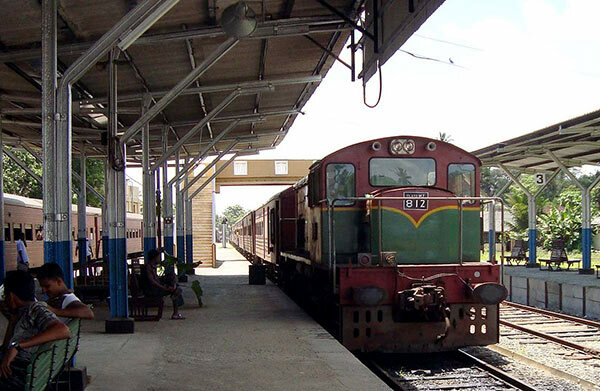 Although the fare revision is made under the instructions of the Central Bank to institutions which did not revise charges even by 15 percent according to budget proposals relating to services produced by State institutions and their administrative costs, train fares had not come under revision for the last 3 years. As such, the minimum charge of Rs.10 per third class, Rs. 20 per second class and Rs. 40 per first class will remain the same under the revision of fares. Season ticket fares will also come under the revision, but the percentage charged will not change. Accordingly, the percentage of 9 times the single trip charge changed for public servants and the 24 times single trip changed for private sector season ticket will also remain the same. The season ticket charges for school, university and pirivena students will be six times the normal fare of a single trip. The rail fare revision is being made after 10 years but still train fares will remain lower than bus fares even after the bus fare revision. However, Colombo to Kilinochchi price remained as 300 Rs.!!! That’s because Killinochchi has the largest percentage of war heroes in any SL community. Their sacrifices should be recognised for at least an entire generation. Dear Mr. Vadivelu Suntaram, I agree with you 100%. I guess these war Heroes never swallowed the Cyanide capsules. I suggest like Indian Freedom fighters (who got free train travel) the Kilinochchi War Heroes should get free Transport privileges. I do not know why the Yaha Palanaya government didn’t consider this! Thank you for agreeing with my comments. The LTT War heroes from Killinochchi decided to carry cyanide capsules to be used when captured by the enemy because had these War Heroes been captured alive, GOSL would have had to spend valuable taxpayer money in holding the captured in Prison, prosecuting them, rehabilitating them and releasing them into society. Each step of this process would have involved Sinhala Buddhist officials engage in corruption; the process would have cost billions of LKR over and above official expenditure. Therefore, as patriotic SL citizens, the LTT War heroes decided to end their lives when captured saving the SL taxpayer billions of LKR’s in corrupt komis. Dear Mr. Vadivelu Suntharam, Than you. But the War heroes you are talking about never used the Cyanide Capsules. According to you they wasted money. Is that you wanna say? Oh I forgot what about 1,000 s of kidnapped children can we give them also free rides in the train? Dear Mr. V. Suntararam, Thank you for your reply. Here we are talking about your so called living war heroes. It seems they were afraid to swallow the Cyanide capsules. I am sure the whole population of Kilinochchi didn’t join LTTE. Is n’t it? Then we are also forgetting about 1,000 s of kidnapped Tamil children. They too were brain washed and forced to wear Cyanide capsules violating all the Human Rights in the world. I think these children deserve to give a free ride in SL trains. What do you think bro? Vadivelu Suntharam , What do you mean by war heroes, These were cowards how used to through bomb and run away and hide,, When faced with out brave solders they got more than they bargain for. So now shut up and live like good little dogs.